In response to the disappearance of the U.S.S. Defiant, the Enterprise moves into a dangerous region of space to locate it. There, in a period of “interphase,” two universes overlap. The Defiant is disappearing into that mysterious universe, and Captain Kirk (William Shatner) -- who becomes trapped on the ship -- is doing so as well. 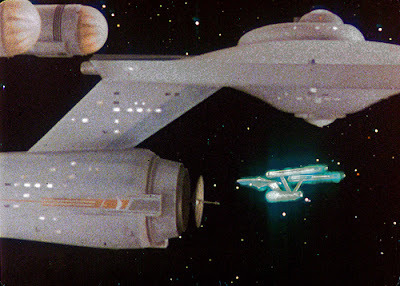 The area of interphase also causes madness and violence in humans aboard starships, and it begins to have a dangerous influence on the Enterprise crew, as Mr. Spock (Leonard Nimoy) takes command, and attempts to rescue the missing Kirk. Making matters worse, the territorial Tholians arrive, and claim this turbulent region of space for the Tholian Assembly. Commander Loskene threatens the Enterprise, but Spock knows the Enterprise cannot leave the area without risking the loss of Captain Kirk. 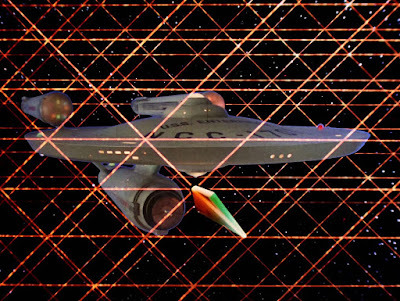 In response, the Tholians begin to create a space web to trap the Enterprise. Spock and Dr. McCoy (De Forest Kelley) bicker over the situation, until they watch Captain Kirk’s last recorded orders, and begin working together -- and racing against time -- to escape the Tholians, save the Enterprise, and rescue their captain. 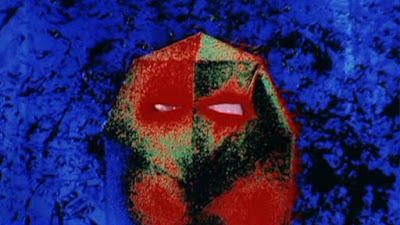 “The Tholian Web” is, without a doubt, one of the best episodes of Star Trek (1966-1969) from its third season. The episode is worthwhile for a number of reasons, but in the final analysis it is succeeds as a wonderful exploration of the central “triumvirate” (Kirk-Spock-McCoy), and the events that happen when one person is subtracted from that close-knit triangle. Here, McCoy and Spock bicker through their grief, since Kirk may be dead, and eye each other suspiciously. It is clear that without Kirk's presence to temper their extreme viewpoints, these two points on the triangle teeter on the edge of outright warfare. McCoy states that he would like to “remedy” the situation, removing Spock from command, for example. The interaction between these characters is not playful. It’s not gentle. It is not tempered by feelings of affection. Rather, McCoy and Spock are clearly at each other’s throats throughout the action here. The logical conclusion is that what binds them together is their friendship and support for Captain Kirk, not necessarily their regard (or respect) for each other. Kirk’s last orders (well-played by Shatner) get these two men, these two Starfleet officers, back on track. Kirk’s tape refocuses Bones and Spock away from their struggle, and back to the one thing that matters more than anything else to Kirk: the safety of the Enterprise. This seems a crucial episode for the heroic triangle for a few reasons. It clearly represents an opportunity for growth, and one that the franchise seizes on. At the end of the episode, Spock and McCoy share a “lie” to their captain. He asks if they watched his final orders. They lie, and say that there was not time to view Kirk's video will during the crisis. Think about what that means for just a moment. You don’t share a lie with someone you don’t trust, or don’t like. That Spock and McCoy join together to spin this untruth to their captain, friend, and superior officer suggests that they have attained a new plateau of trust or comfort with one another. Despite everything that Spock and McCoy went through, they have found a way to work together, to co-exist, in “The Tholian Web,” without the peace-maker presence of Kirk. That’s a big deal, and a big step for their friendship. We have seen in previous Spock/McCoy moments (in episodes such as “The Trouble with Tribbles,” “The Immunity Syndrome” and “Bread of Circuses”) that when left alone together, away from Jim's presence, these two officers battle. They zing each other with harsh witticisms. Here, they get past that stage, for the first time, and so one might make the argument that “The Tholian Web” represents an important aspect of the Spock/McCoy friendship. Eventually, McCoy will tell Spock that he “never ceases” to amaze him (Star Trek V: The final Frontier ) but that’s a sentiment that it is difficult to imagine Bones voicing in the trenches of the first, second, or early third season of Star Trek. One must wonder if losing Jim, and facing this crisis together, forged a connection between the two men that built the friendship we saw by the time of the motion pictures. I will state this another way, one more in keeping with concepts of the episode. 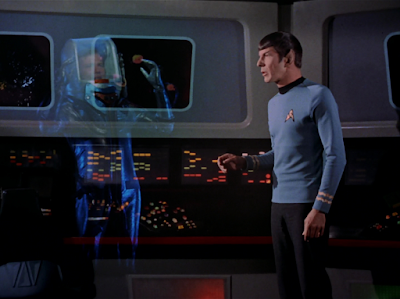 From a certain perspective, "The Tholian Web" is about putting aside the "ghost" of Captain Kirk. Crew members keep seeing the missing captain and McCoy wonders if this is so because the officers have lost faith in Spock. But McCoy feels guilty about giving his loyalty to a new captain. and Spock feels guilty and responsible, as well, for what has occurred to Kirk. Then, Spock and McCoy exercise that "ghost" -- that haunting spirit -- by conducting a funeral service of sorts; by watching his last will. It's as if, in their minds, following this viewing, Kirk can finally rest. His last orders have been issued, and Spock and McCoy can move forward to the next step. That next step, in this case, actually involves his rescue. But they had to move past "the ghost" of Captain Kirk that was paralyzing them, that was locking them in their cycle of grief and anger. The question, of course, arises: why lie to Captain Kirk during the episode's final scene? His last orders proved incredibly helpful to Spock and Bones. Why shouldn’t he know this? Here again, Spock and McCoy have realized they have something in common. They don’t want to appear weak before their captain. They would rather lie -- putting aside their differences in the process -- than acknowledge that they were lost without him, and that his guidance was very much needed. Beyond this examination of the triumvirate, and particularly Spock and McCoy, “The Tholian Web” is notable for adding a fascinating new, non-humanoid (non-mammalian…) alien race to the catalog: the Tholians. Tholians are (apparently) crystalline in nature, known to be punctual, and evidence a technology far different from the other races we have met so far in the Alpha Quadrant (Romulan, Klingon, Gorn). They spin their “webs” around enemy starships, and their (Emmy-Award nominated) space toils make for dynamic and unforgettable visuals. In a very real sense, Spock is “trapped” in a web in this episode. He must battle the crew, rescue the captain, defeat the interphase insanity (as it applies to the Enterprise crew), negotiate with an alien race, and keep his feelings of loss and grief in check. This is a tangled web, indeed, and it’s rewarding how "The Tholian Web" also gives him a literal (energy) web to navigate. 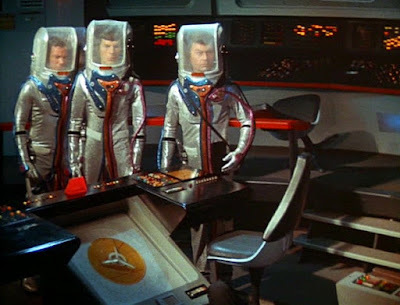 “The Tholian Web” is notable as well for granting audiences a first look at Starfleet space suits, which are very distinctive (and form fitting...), as well as Uhura’s quarters. In fact, Nichelle Nichols’ Uhura has a good, supporting role in this episode; one that showcases her humanity (and loyalty) well. Nyota’s colorful, distinctive quarters go a long way towards the same goal, reminding us of the character's individuality. After the first season, we rarely get to see Uhura during off-duty hours, so those moments here help make the episode a special and memorable one. In short, "The Tholian Web" features great character moments for Spock, McCoy, and Uhura, introduces memorable new aliens and equipment, and dramatizes an emotional story of Kirk's "ghost" wherein form reflects (emotional) content. It is an episode that hits on all thrusters, as Bones might say. With this review of "The Tholian Web," you've achieved maximum credibility. Only a person with a well-versed knowledge of Trek lore and a history of acquaintance with fan criticism could have addressed the vagaries of Spock and McCoy's arguments point by point. This is a thoroughly enjoyable review! 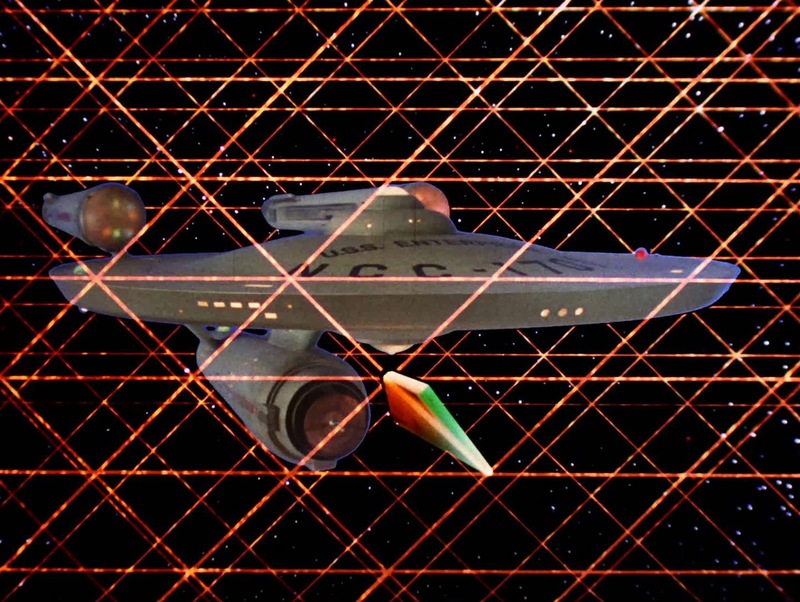 "The Tholian Web" was one of my favorite episodes of Star Trek as a kid, and remains so to this day. The image of the Enterprise caught in the alien web was turned into a large poster for the first issue of the Star Trek Giant Poster Book, and it hung on my bedroom wall for quite a long time. I also had the Star Fleet Medical Reference Manual book, released around the same time. It revealed what the Tholians looked like below the limits of the Enterprise viewscreen: their heads were basically attached to a prism of sorts, with no appendages or limbs of any kind. I guess they were just supposed to float! However, when Star Trek: Enterprise showed them to be crystalline spiders, it seemed so obvious, didn't it? There is another element to this episode which adds to its greatness: Space is dangerous. In the cosmos await many phenomena for which we as humans will be totally unprepared. In the midst of dealing with a threat so alien, creatures who are completely unlike us in form appear to complicate and drive home the point that we can only depend on one another to make it through. I think that foreign, odd feel which permeates this episode contributes to making Spock and McCoy's dilemma, and its resolution, so much more profound. Also, the crew's loyalty to their captain, their belief and tenacity in their hope that all is not lost, is powerfully felt and resonates. This episode has a "Never Give Up" quality which I appreciate very much. Whenever I watch "The Tholian Web" on blu ray, I always choose the original effects, which are still stunning and still hold up today. I understand what the artists were trying to achieve in their updating of the effects, and the Tholian ships. However, my opinion is that the ships work best as blurry, non-tech objects. The episode is dreamlike, and the original effects perfectly capture the alien-ness of the events. I love "The Tholian Web" exactly as it is, grainy effects and all. Steve, I agree, the original Tholian ships were better. I'd forgotten that "Enterprise" episode (I've tried to forget the entire series) that made the Tholians appear to be crystalline spiders. That is most interesting because it's another element bearing remarkable similarity to the outline treatment William Shatner had submitted--for which he never received credit--from which most of his ideas ended up being incorporated into "The Tholian Web". I maintain to this day that Shatner should have demanded a Writers' Guild review over this episode. Under the rules in effect at the time, he may not have received a "written by" screenplay credit, but he should have received a "story by" or "based on a story by" credit. I don't understand why he didn't pursue it. 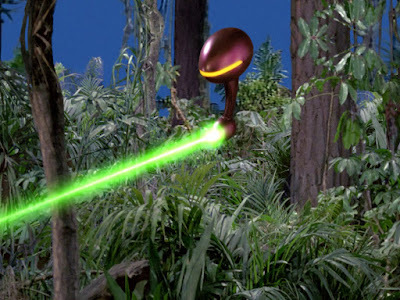 I forgot to mention in my main post how much I think the "alien-ness" of the Tholians is amplified by the sound design of this episode. Their ships behave in unusual ways, the look and feel of the Tholians is very different although our glimpses are brief, and they sound most unusual. This is a very fine episode in every way, and the heck with those who thoughtlessly dismiss Season Three as The Bad Season! I didn't know that about Shatner! It's not even alluded to or mentioned in Volume Three of "These Are The Voyages" by Marc Cushman. I'd love to read a copy of Shatner's original treatment! I agree with all of your points. I first saw the episode in syndication, and was amazed by the visuals. I can only imagine what it must have been like seeing this when it originally aired. One thing Mr. Cushman's book does go over in detail is the effects, and how they were achieved. One man, Mike Minor, animated all of those webs by himself! It's a great read, and if you ever get a chance, check it out! Thanks for your insights! Steve, just FYI, the Shatner story is mentioned in Cushman's books--but I can't recall exactly where (it isn't in the synopsis of this episode.) Skim those volumes again, it's in there. I'd run across the story someplace else in the late 70's also, but memory is dim (Starlog? Cinefantastique? Some obscure tabloid?) I have some problems with various points of accuracy in Cushman's books, but he presents an overall series history quite well. My only issue with Mr. Cushman's books is his critiquing episodes to a degree that it becomes distracting. Okay, we get it, you didn't like this episode! He does the same thing with the Lost In Space books he's written. That said, he's entitled to his opinions, and the books are overall excellent and really incredible resources, and I love 'em warts and all. Nobody else is doing the work he's done, and he's to be commended for that. Thoughtful review of one of my favorite episodes, John. 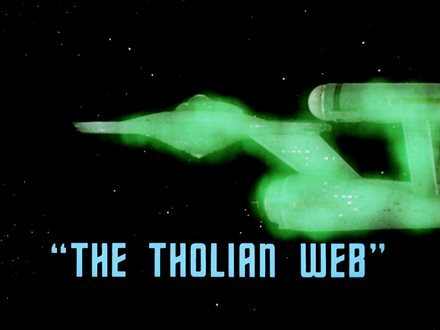 I place "The Tholian Web" very highly among Star Trek episodes. It's a fine character-driven story, as all the best ones are, and its ticking-clock component creates tension on a par with that of "The Corbomite Maneuver" or "The Doomsday Machine". William Shatner should have sued over this story, by the way: he had written a very similar outline and synopsis treatment quite early on, and he should have received a "story by" or "based on a story by" credit at the time. I'd add what you didn't mention, John: the always-present tension between McCoy and Spock, which springs to the fore whenever Kirk's moderation is absent, is amplified in this instance by the effects of interspace. At their worst moment, McCoy realizes he's way out of line and out of bounds, and apologizes for it--and Spock recognizes he is not himself. But your point about the triumvirate's dependence on Kirk is well taken. In fact, I've pointed out before, this trio really represents externally the internal forces of the human identity: id, ego, and superego, each of which is crucial to a whole self but dependent on the moderating force of the healthy ego for balance. I think Spock and McCoy lie about the last orders to avoid causing Kirk pain, not because they don't want him to think them weak. They know he relies on them both and don't wish to burden him with the knowledge that they tend to succumb to their worst tendencies--become unreliable--in his absence. The fact that there's no scene in which they agree to cover for each other suggests they've reached the same conclusion independently and instinctively; they've found common ground and learned from this experience. And, yes, that "last orders" scene couldn't be better acted--or better written! My two favorite episodes as a kid were The Immunity Syndrome and The Tholian Web. I found it interesting that both episodes also feature no guest stars. I liked Star Trek best when the stories focused primarily on the main characters without a lot of distracting characters and cultural background stuff to sort through. Just give them a threat and let them work it out. My other favorite is The Doomsday Machine which features only one guest star, the great William Windom who's welcome in anything as far as I'm concerned. I also find it interesting that, in spite of the reduction in budget, the special effects in the third season are quite exceptional.